Review: Augusta 'Gus' has some goals she'd like to accomplish before age 30. Have a good job that she loves and be in a stable relationship. The good news? Gus loves her job as a librarian. The bad news? She recently caught her boyfriend (a friend she's known since college) kissing her freshman year college roommate. 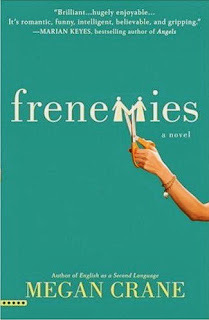 'Frenemies' starts with Gus, newly single, having a hard time handling her ex dating her supposed 'friend' Helen. After Gus embarrasses herself in public after a few drinks too many, she tries to get her life back on track with the help of her girlfriends. But she keeps running into her ex boyfriend and ex friend, Gus is forced to deal with her feelings for both of them, while navigating a possible new love interest. I downloaded this from the library and was pleasantly surprised. I really enjoyed this book. It was funny (I laughed out loud a few times, a rarity for me when reading) and could relate with Gus. Although the ending was predictable, I read this in one sitting. Very fun chic-lit!